Sooth Chutney: Sooth (or Saunth) chutney, is a sweet chutney used in Indian chats. It is made from dried ginger (sooth) and imli (tamarind) paste, hence the name. The chutney is brownish-red in color. Modern sooth is often made with dates. However, sooth made with dried ginger adds a special flavor to the chat and is preferred in most parts of North India. Fry the garlic slices in the olive oil. Slice the dates into halves. Add dates, sesame seeds and ground pepper into the hot oil. Add sugar to the mixture. Stir continuously over a low heat, until the mixture becomes soft. Simmer until mixture is well pureed. 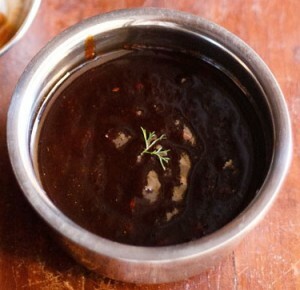 Bottle the sooth chutney in an airtight glass container. Store the bottled sooth chutney in the refrigerator. If you have any queries about this Sooth Chutney Recipe , please write down in comment box below.